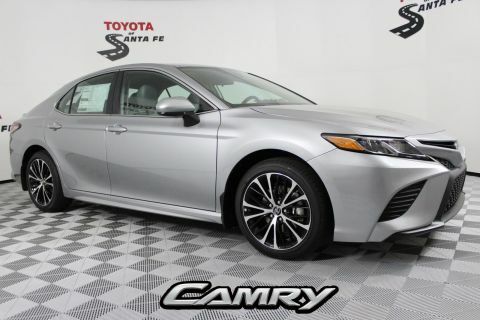 Variable New 2019 Toyota Camry Hybrid XLE stock # KU510999D has Galactic Aqua Mica exterior with a Black and Leather upholstery. 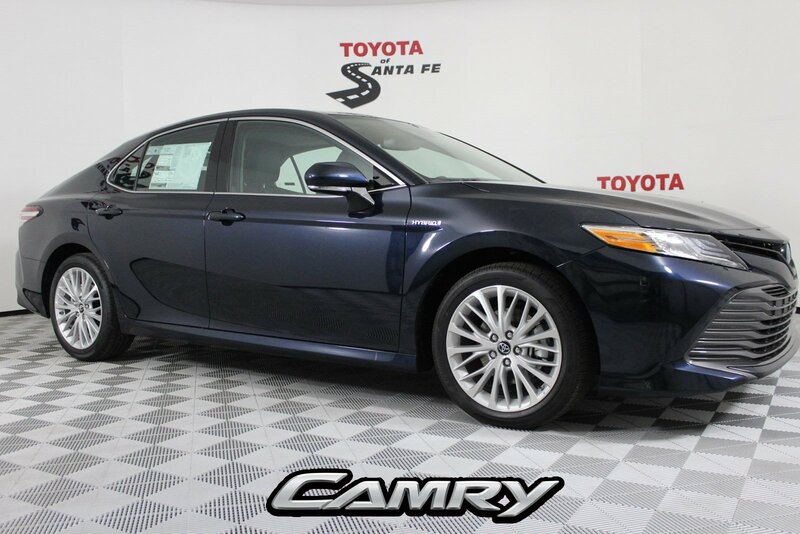 This New Mexico Sedan has 4 doors and carries 5 passengers. 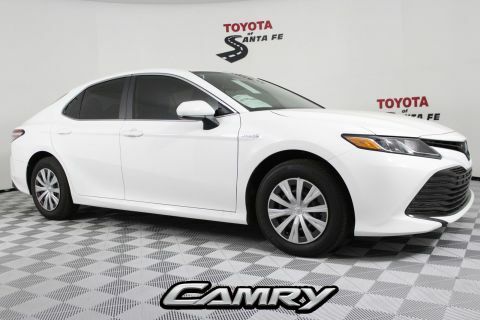 Some of the options include: Multi-Stage Heated Front Bucket Seats, Quilted Perforated Leather Seat Trim, Radio: Entune 3.0 Audio Plus, Radio: Entune 3.0 Audio Plus w/JBL Audio, Navigation Upgrade, Sunroof Package, Rear Bumper Applique (Clear), Alloy Wheel Locks, Carpeted Floor Mats & Trunk Mat Package, 4-Wheel Disc Brakes, 6 Speakers, Air Conditioning, Electronic Stability Control, Front Bucket Seats, Front Center Armrest, Leather Shift Knob, ABS brakes, Alloy wheels, Automatic temperature control, Brake assist, Bumpers: body-color, CD player, Delay-off headlights, Driver door bin, Driver vanity mirror, Dual front impact airbags, Dual front side impact airbags, Four wheel independent suspension, Front anti-roll bar, Front dual zone A/C, Front reading lights, Fully automatic headlights, Garage door transmitter: HomeLink, Heated door mirrors, Heated front seats, Illuminated entry, Knee airbag, Low tire pressure warning, Occupant sensing airbag, Outside temperature display, Overhead airbag, Overhead console, Panic alarm, Passenger door bin, Passenger vanity mirror, Power door mirrors, Power driver seat, Power passenger seat, Power steering, Power windows, Rear anti-roll bar, Rear reading lights, Rear seat center armrest, Rear side impact airbag, Rear window defroster, Remote keyless entry, Security system, Speed control, Speed-sensing steering, Split folding rear seat, Steering wheel mounted audio controls, Telescoping steering wheel, Tilt steering wheel, Traction control, Trip computer, Turn signal indicator mirrors, Variably intermittent wipers, Auto-dimming Rear-View mirror, Heads-Up Display, Compass, Mode select transmission, AM/FM radio: SiriusXM, Exterior Parking Camera Rear, Auto High-beam Headlights, Emergency communication system: Safety Connect, Blind spot sensor: Blind Spot Monitor w/Rear Cross-Traffic Alert warning, Distance pacing cruise control: Dynamic Radar Cruise Control (DRCC), REAR BUMPER APPLIQUE (CLEAR), NAVIGATION UPGRADE -inc: Radio: Entune 3.0 Audio Plus w/JBL Audio Qi-compatible wireless smartphone charging Clari-FI Connected Navigation and App Suite 8 touch-screen AM/FM CD player MP3/WMA playback capability 9 speakers in 9 locations auxiliary audio jack USB 2.0 port w/iPod connectivity and control voice recognition hands-free phone capability and music streaming via Bluetooth wireless technology Scout GPS Link App w/moving maps w/3-year complimentary trial Siri Eyes Free Google voice controls HD Radio Entune App Suite SiriusXM Satellite Radio w/3-month complimentary SiriusXM All Access trial Gracenote album cover art Entune 3.0 Toyota Connected Services Safety Connect w/3-year complimentary trial Service Connect w/3-year complimentary trial Remote Connect w/6-month complimentary trial and Wi-Fi Connect Powered by Verizon w/up to 2GB within 6-month complimentary trial, CARPETED FLOOR MATS & TRUNK MAT PACKAGE, PAINT PROTECTION FILM -inc: hood fenders mirror backs and door cups, SUNROOF PACKAGE -inc: power tilt/slide sunroof and moonroof, ALLOY WHEEL LOCKS, Front Wheel Drive, Power Steering, Remote Engine Start, Woodgrain Interior Trim, Passenger Vanity Mirror, Traction Control, Daytime Running Lights, Heated Front Seat(s), Bucket Seats, Blind Spot Monitor, Power Mirror(s), Tire Pressure Monitor, ABS, Bluetooth Connection, Power Door Locks, Driver Illuminated Vanity Mirror, Keyless Entry, Driver Vanity Mirror, Climate Control, CD Player, Engine Immobilizer, WiFi Hotspot, Child Safety Locks, Passenger Air Bag Sensor, AM/FM Stereo, Front Side Air Bag, Rear Defrost, Auto-Dimming Rearview Mirror, Leather Steering Wheel, Cross-Traffic Alert, Back-Up Camera, Trip Computer, A/C, Tires - Rear Performance, Passenger Adjustable Lumbar, Integrated Turn Signal Mirrors, Heated Mirrors, Cruise Control, Auxiliary Audio Input, Keyless Start, Smart Device Integration, Intermittent Wipers, Knee Air Bag, Lane Keeping Assist, Power Windows, Rear Bench Seat, Remote Trunk Release, Driver Air Bag, Power Passenger Seat, HD Radio, Satellite Radio, Steering Wheel Audio Controls, Brake Assist, Automatic Headlights, Aluminum Wheels, Rear Head Air Bag, Variable Speed Intermittent Wipers, Stability Control, MP3 Player, Heads-Up Display, Security System, Rear Side Air Bag, Leather Seats, Tires - Front Performance, Multi-Zone A/C, 4-Wheel Disc Brakes, Power Driver Seat, Driver Adjustable Lumbar, Passenger Illuminated Visor Mirror, Telematics, Lane Departure Warning, Temporary Spare Tire, Adaptive Cruise Control, Universal Garage Door Opener, Adjustable Steering Wheel, Front Head Air Bag, Pass-Through Rear Seat. 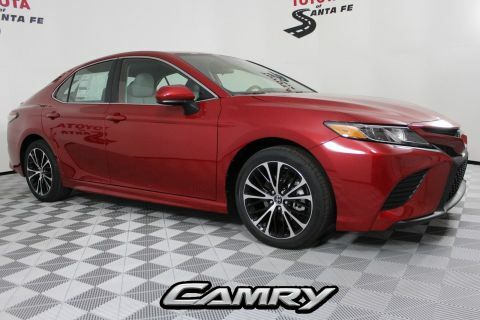 Ask for stock # KU510999D, the Santa Fe New Mexico new 2019 Toyota Camry Hybrid XLE.Call right now and schedule a test drive. 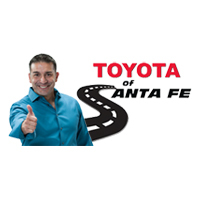 Visit us online at www.toyotaofsantafe.com or in person at 1601 Saint Michaels Drive, Santa Fe, NM 87505. We serve all of New Mexico. Price includes all costs to be paid by consumer except for sales tax, registration, title, and $369 dealer transfer service fee. Price is valid for date of sale only. Internet price includes all available offers, incentives, and factory rebates assigned to the dealer.